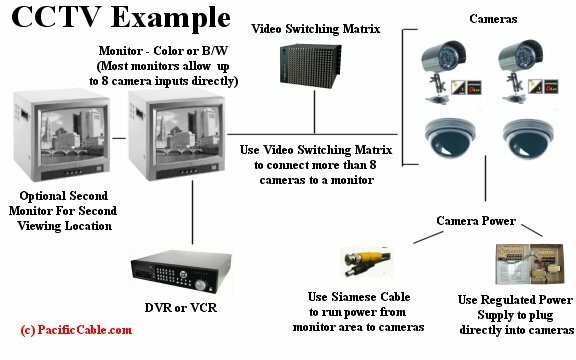 Security Cameras - PacificCable.com - 1-800-931-3133. PacificCable.com carries Security Cameras. If you need a Security Camera not listed here, and/or pinout drawing identified call us at 800-931-3133 or email a request and any documents to sales@pacificcable.com. KPC-400 B/W Camera CCD Chip, 420 Lines, Auto Iris and Back Light Compatible. Special Order. Non-Returnable. KPC-600 Board Camera w/ Square Housing. 1/4 Inch Color CCD (Standard 3.6mm), 420 lines, 1 lux. Special Order. Non-Returnable. BB1030S Board Camera, B/W Micro Video Camera w/ 430 Lines @ 0.01lux (Standard Lens) Special Order. Non-Returnable. BC2003 Board Camera, Color, 380 Lines @ 0.5lux. 31X31mm, 1/4 Inch CCD. Special Order. Non-Returnable. BC2003HDN Board Camera, Color, High Res. DSP Day & Night Board Camera, 450 Line, 0.01 lux. Special Order. Non-Returnable. BB1009 Dome, B/W Camera, Impact Resistant with 420 Lines @ 0.01 lux. Special Order. Non-Returnable. BC1009 Dome, Sony CCD Color Camera, Impact Resistant, 420-450 Lines @ 0.5 lux. Special Order. Non-Returnable. BC1009AVA Dome Camera, Vandal Proof, 1/3 Inch Sony 450 to 480 Lines @ 0.5 lux. Day and Night 4 to 9 mm. Special Order. Non-Returnable. BC1009HDN/12/24 1/3 Inch Sony Super Day & Night Color Dome Camera, 420 to 450 Lines @ 0.5 lux, dual 12V/24V. Special Order. Non-Returnable. BC1009IRAD Dome Camera, Vandal Proof, IR Sony CCD Color 420-450 lines @ 0 lux, 35ft-40ft 3.6mm lens. Special Order. Non-Returnable. BC1009IR High Res IR Color Dome Camera, 420-450 Lines @ 0 lux, (IR 30 ft), Built-in 12 LEDs 3.6mm lens. Special Order. Non-Returnable. BC2009HG High Res. Gimbel Dome Camera, 420-450 Lines, 3 Axis Gimble For Wall Mounting. Special Order. Non-Returnable. BC2009AVA Vandal Proof Outdoor Dome Camera, Sony Super 420-450 Lines, 0.2 lux 4-9.0mm Vari-Focal / Auto Iris. Special Order. Non-Returnable. BC2009/WM1 Dome Camera, Miniature Sony Color CCD, 420 to 450 Lines, 0.5 lux, Size: 90mm (Diameter). Special Order. Non-Returnable. BC2009/WM2 Dome Camera, Miniature Sony Color CCD, 420 to 450 Lines, 0.5 lux, Size: 100mm (Diameter). Special Order. Non-Returnable. BB1031 Bullet Camera, Weather Proof B.W with Standard Lens & Mounting. Special Order. Non-Returnable. BB1032 Bullet Camera, Indoor B/W with Mounting Bracket. Pinhole Lens. 3.6mm lens. Special Order. Non-Returnable. BC1039 IR Bullet Camera Proof Color, 450 Lines @ 0 lux (IR 25 Ft.) Unbreakable Bullet Proof Shell. 3.6mm lens. Special Order. Non-Returnable. BC2035H IR Color Bullet Camera, Weather Proof, 420 Lines @ o lux (IR 30 Ft.)with Bracket & Sun Shade 3.6mm lens. Special Order. Non-Returnable. BE1025/120CAM IR Bullet Camera with Aluminum Housing. 1/3 Inch CCD Color, 420 Lines @ 0 lux. 12 LEDs (160 Ft.) 3.6mm lens. Special Order. Non-Returnable. BB1001/12/24 Professional CCD, 430 Lines, 1/3 Inch CCD, 12VDC/24VAC. Special Order. Non-Returnable. BC2002/12/24 Sony CCD, 1/4 Inch Color DSP with 420 Lines @ 0.5 lux, 12VDC/24VAC. Special Order. Non-Returnable. BC2002HDN/12/24 Sony CCD, 1/3 Inch Sony Super HAD Day & Night, 480 Lines, 0.001 lux, 12VDC/24VAC. Special Order. Non-Returnable. BC2002/EXVIR Sony CCD, 1/3 Inch Color ExView Sony, 100 Ft. IR with 4 LED, 480 Lines, 2x Digital Zoom. Special Order. Non-Returnable. BE-VDP High Resolution Video Door Phone (B/W). Special Order. Non-Returnable. BE-VDPC High Resolution Video Door Phone (Color). Special Order. Non-Returnable. 203-035 4-Channel A/V Wireless Camera Set-2. Special Order. Non-Returnable. BC1009-SPJN70 Color Outdoor PTZ. 520 Lines @ 0.06 lux. 352x Zoom (22x opt. 16x dig). 4 Privacy Masking. Special Order. Non-Returnable. BC1009-SPJN80 Color Indoor Ceiling. 520 Lines @ 0.06 lux. 32x Zoom (22x opt. 16x dig.). 4 Privacy Masking. Special Order. Non-Returnable. BC1009-SPDN70 Color Outdoor Day & Night. 520 Lines @ 0.4 lux (color) / 0.002 lux (mono). 4 Privacy Masking. Special Order. Non-Returnable. BC1009-SPDN80 Color Indoor Ceiling Day & Night. 520 Lines @ 0.4 lux (color) / 0.002 lux (mono). 4 Privacy Masking. Special Order. Non-Returnable. BC1009-SPAN100 Color Outdoor 1/3 Inch Sony CCD. 480 Lines @ 0.7 lux with 352x Zoom. Special Order. Non-Returnable. BC1009-SPAN200 Color Indoor 1/3 Inch Sony CCD. 480 Lines @ 0.7 lux with 352x Zoom. Special Order. Non-Returnable. BC1009-PTZMINI Color Outdoor 1/3 Inch Sony HQ1. 540 Lines. 100x Zoom (10x opt. 10x dig.). Day & Night. Special Order. Non-Returnable. BC1009-3CL Color Mini Speed Dome with Pan & Tilt. 470 Lines @ 0.5 lux with 2x Digital Zoom. Special Order. Non-Returnable. BC1009-SPVP Color Vandal Proof Mini Speed Dome. 470 Lines @ 0.5 lux with 2x Digital Zoom. Special Order. Non-Returnable. BE-KB03 Computerized Surveillance Controller for PTZ, 3 Axis. Special Order. Non-Returnable. AD-300 One-Channel Coaxitron Converter (Magic Box) for PTZ. Special Order. Non-Returnable. AD-3016 16 Channel Coaxitron Converter for PTZ. Special Order. Non-Returnable.